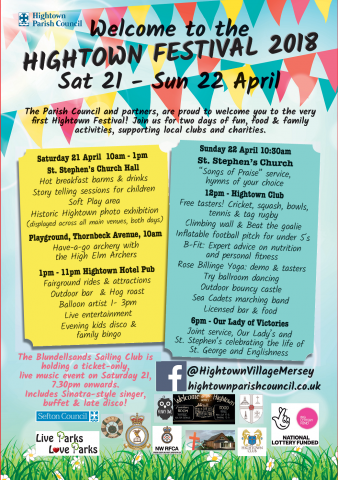 Hightown Parish Council is hosting the inaugural Hightown Festival over the weekend of 21st- 22nd April. The festival is not only aimed at the residents of Hightown, but we also hope to attract residents from many of our neighbouring communities including Thornton, Little Crosby, Ince Blundell, Little Altcar, Crosby, and Formby. The first is an evening event on Saturday 21st April (7.30 pm start) hosted by the Blundellsands Sailing Club (The Foreshare, Thornbeck Avenue, Hightown), which comprises a hot and cold buffet, live entertainment provided by Richard Holmes who will sing Rat Pack style favourites, and followed by a disco until late. Tickets are £15 /person and include the buffet. 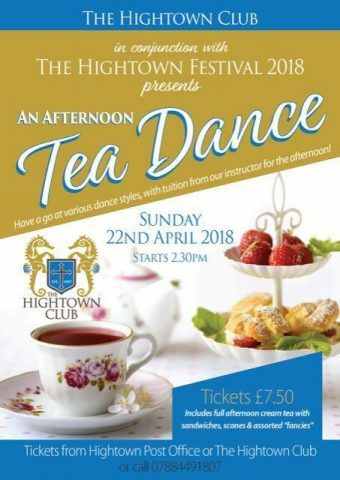 The second event is an afternoon tea dance (2.30 pm start) on Sunday 22nd April which will be hosted (includes instruction on dance steps if required), and includes an afternoon tea. Tickets are priced at £7.50/person and include the afternoon tea. Citizens’ advice sessions available in The Hub every Tuesday 10-12 noon – no appointment necessary. At our recent Open Meeting Thornton Parish Council were delighted to award the first Freedom of Thornton to Mrs Clare Peet in recognition of her commitment and unstinting work for the community of Thornton. 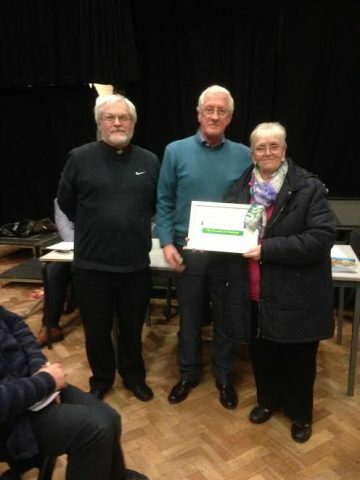 Pictured below is Mrs Peet receiving the award from Cllr Hounsell and Fr Harrington from St William of York. Following the Local Democracy, Economic Development and Construction Act 2009, Parish Councils now have the power to award the Freedom of the Parish. Should be awarded in recognition of exceptional contribution or service to the community over a prolonged period of time to a person of distinction. Can be awarded to any resident of the Parish, or person outside the Parish, who renders an identifiable and consistent contribution/service to the Parish of Thornton . Can be proposed by any resident in the Parish or by Parish Councillors. Parish Councillors will have absolute discretion regarding who receives and award. It is not necessary to award if no-one is proposed and it is not a requirement that anyone is appointed even if proposed. This is an award, solely in the gift of the Council and confers no material honours or special privileges nor does it entitle the person to participate in the proceedings of the Council meetings or in any ceremonial events. It is purely and simply awarded for merit. Anyone wishing to nominate an individual for a freedom should contact the Clerk. Our Chair Cllr Ken Hounsell attended the Hearing (Public Enquiry) into The Plan for Sefton on Thursday 14th January 2016 and submitted the following contribution on behalf of both the Parish Council and local residents. I intend to address you today with regard to plots MN2.23 and MN2.24 in the Parish of Thornton but the argument I intend to put forward is also relevant in whole or in part to plots MN2.25 and MN.2.26 which border our Parish but are in the Parish of Sefton. In my view the sites in question are totally unsuitable for housing because of their propensity to flood. The Plan assumes that no other demand will be made upon the sites when developments at the Port of Liverpool may indicate otherwise. The Parish of Thornton is effectively split into two parts by the new road Brooms Cross Road or A5758, the urban part to the west and the rural areas of Homer Green and Lunt which are to the east. The rural area stretches out for about a half mile where is it bordered by the River Alt. The greater part of the area between the new road and the River Alt is a flood plain managed by the Environment Agency which has a plan should the Alt burst its banks at least once in 100 years. I think recent events in Cumbria, Lancashire and Yorkshire have indicated the value of such schemes when some of them failed 3 times in 3 weeks. I learned on Monday last that a minor breach of the banks of the River Alt occurred over the holiday period and a number of fields were flooded. The urban part of Thornton is inundated with problems of localised flooding principally because of the inadequacy of the current systems which are all ancient and cannot cope with the extreme conditions we get these days. The problem is not helped by the failure of riparian owners to carry out their responsibilities. I have lived in present home for 43 years and over Christmas my rear garden in common with all of my neighbours who live on Quarry Road and Hartdale Road which runs parallel but to the rear of us was flooded for 3 days. They are all flooded again at the moment. Sefton MBC to their credit has constantly sought to rectify problems but no sooner is one repair effected than another problem arises. I have received further information this week that gardens in other parts of urban Thornton have been flooded. Most of the ditches and watercourses lack maintenance and are overgrown. Drivers using Brooms Cross Road cannot fail to notice the four attenuation ponds along its route. These are designed to collect and retain all of the surface water from the new road and retain it until such time as it can be released into local ditches and watercourses for subsequent discharge into the River Alt and then out to sea. When I passed the pond at the Thornton end of the A5758 yesterday, Wednesday 13th January, it was full and some of the surrounding fields although not flooded were waterlogged. A very recent and new development also occurred over the holiday period which affects Plot MN2.23. As you are probably aware part of this site was formerly the old A565 which was torn up and returned to the ‘green belt’ only to be assigned for housing in the Plan for Sefton. On Monday last I learned from residents of Southport Road, which is the only residential area bordering the new road that surface water had washed off the site of the old road on a number of occasions recently into the service road which fronts the houses resulting in a sea of mud and debris both in the road and some of the front gardens. I feel I need not go on ad infinitum on this theme because recent events have surely proved the abject stupidity of building houses on or near land which is prone to flooding. I trust that Local Authorities and the National Government will take this on board and learn from events of recent weeks. I can assure you Sir, that both of these sites are totally unsuited to housing and for Sefton Council to offer them for this purpose is totally unacceptable. I would now like to take you back to 2011, when Sefton was finalising its Core Strategy document which contained 3 options from which The Plan for Sefton would be developed. I with many others attended a briefing which was based around a map showing many potential building plots, some of which would ultimately be included in the Plan for Sefton and some of which would be eliminated by various processes before the final plan was completed. The one thing which I noticed about the map was that the new road was not on it. I had been associated with the new road from its inception and was surprised at its absence and asked why it was not shown. I was told that there was no certainty that the road would be built. I thought this explanation was rather strange in that the road, which had been an aspiration of Sefton for over 60 years, had been approved by the Labour Government in 2010 and the Council was moving towards the construction stage. It is true however that the new coalition government which came into power in 2011 had called in this project and many others across the country for scrutiny to assess the business case and their value for money. However I let the matter rest at the time. As time passed and I became more and more familiar with the Plan for Sefton and what it involved, I started to think and came back to the absence of the new road from the plan and the explanation for it. What struck most of all was that Sefton Council was asking us, the members of the public, to accept plans for the borough covering the next 15 years or so which were based upon speculation that statistics produced by the National Office would lead to increases in population and a demand for new houses etc. Yet at the same time it showed a blatant lack of confidence in its own plan for the new road which had been approved by one government. I came across Paragraph 4.42 which relates to an Early Review of the Plan. I consider that this paragraph and the two which follow it amount to an excuse for not including the surveys referred to in the plan when it was being put together. I have also read other parts of the Plan which refer to the need for development in the ‘transport sector’ and what strikes me is a deliberate intention on the part of Sefton Council to leave any constructive intentions to develop new routes and to alter existing ones with one or two minor exceptions out of the Plan altogether. I believe this to be because they were politically bad for the Council because of the opposition which would be generated by any concrete proposals in this area. My reasons for this is that the route to the Port of Liverpool from the M57 and M58 motorways is the A5036T Dunnings Bridge Road, Church Road which runs due West from Switch Island to the Port of Liverpool at Seaforth. Throughout its length it is a dual carriageway. Along its length it is bordered by light industry and semi-detached houses and at various times it is heavily congested. My niece lives in a house bordering the road and life is not easy I can assure you. Quite rightly Sefton MBC and Peel Ports recognised that at certain times the route is full to capacity and that something needs to be done to relieve congestion and provide better access to the Port. There is a reference to this route in the Plan. I am absolutely certain that all the surveys etc, will indicate the need for a new road running parallel to the existing route through what is known locally as Rimrose Valley and which lies approximately one half mile to the north of the existing route. Why am I so confident of the outcome of the surveys? Quite simply because in the early 1970’s, the Borough Engineer at the time produced such a plan which he presented to the local Highways Committee. The plan was of course aspirational in nature because it depended upon the construction of the long awaited ‘Thornton Bypass’. That by-pass is now open to traffic and is known as Brooms Cross Road. If a new link to the Port of Liverpool was built then it would entail traffic continuing along the new road until it reaches the roundabout at Buckley Hill Lane and then moving onto the new road through Rimrose Valley and access to the Port of Liverpool at Seaforth. Effectively most of the design work had been done at the time the Plan for Sefton had been compiled except for assessments of current traffic flows and the movement of vehicles but for some reason Sefton left it out of its plan. I believe that was to avoid a political backlash from local communities who did not wish to see their beloved Rimrose Valley replaced by a major Highway. It is significant that Sefton brings the Liverpool City Region into the equation in its Plan for Sefton. Could that be an attempt to share responsibility? As a consequence of the development of improved access to the Port of Liverpool, I believe that ramifications could arise for Brooms Cross Road in the future which might require it to be converted to a dual carriageway to provide the maximum of benefit. If this is the case then parts of the plots which I have referred to in this submission may well be required for transport purposes rather than housing. I should of course confirm that Sefton has no plans to increase the capacity of Brooms Cross Road but the whole thing about the Plan for Sefton is that it is based upon speculation and we, the public, should not be denied a share in that process. Land which the Council knows is vulnerable to flooding has been allocated for the building of houses. The Plan contains no concrete and substantial recommendations for improvements in the local highway network despite the fact that the planners must have been aware at the time they compiled their plan of the nature of the transport improvements that were needed and the location of them yet they failed to include them.